The list is out and if you’re a dog you are probably waiting with baited breath to find out what kind of costume are they going to put you in this year. The National Retail Federation said that Americans will spend $350 million on pet costumes and the costumes run the gamut from predictable to far-out. Lets start with what’s new. According to Costumesupercenter.com, the Minion Pet Costume is new, along with Wonder Woman, Teenage Mutant Ninja Turtles, Darth Vader, Captain America and Ghost Busters. Some of these are old hat for humans, of course, but they fall into the latest fashions category for dogs. Troy Eaves of Halloweencostumes.com says the trend seems to be that people will buy a pet costume to complement what the owner is wearing. So don’t be surprised if you see a family of Ninja Turtles and one of them has 4 legs. Eaves also said that, “People really like to dress up their dogs like food.” Big sellers so far this year are the hot dog and taco. 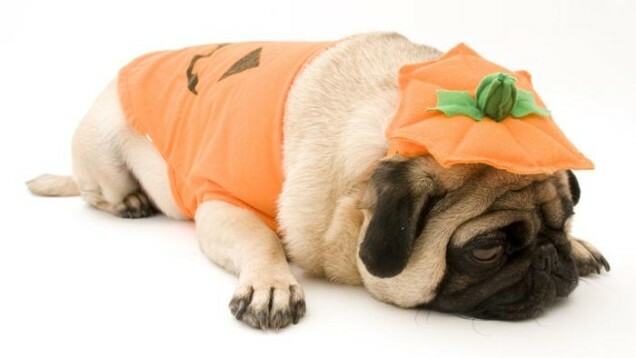 Pugs seem to be the dog of choice for these costumes. You can’t go wrong with Star Wars costumes, Eaves said. If you have a favorite sports team, let your dog be the cheerleader or star quarterback. Many team options are available but be warned they do sell quickly. Prices can range from $4 to $28 on most commercial sites, although I did find a site called Poshpuppyboutique.com and they had a lederhosen dog costume for $40. Some of their costumes were a little more pricey but also more original. Just be careful your dog can’t swallow any part of the costume and that they can see where they are walking. Remember chocolate is a killer for dogs. Stick to dog treats. After all, your dog is still a dog, even if he’s dressed like Elvis. via Hottest trends for pets this Halloween.